Day Four, our last full day of riding Switzerland. Our legs are starting to tire from the long week, not to mention the intense ride prior afternoon on the track, followed by a fancy dinner in Montreux. But the fatigue had to wait, today is a big day. We are about to climb the Col de la Croix. The Col de la Croix is situated in Vaud and is part of the Alps. Starting from Ollon, the Col de la Croix ascent is 18.5 km long. Over this distance, you’ll climb 1262 meters. The average percentage thus is 6.8 %. Sounds fun? For a Sufferlandrian, it’s what we do before breakfast, chew on massive climbs through Suffer Valley. After breakfast, we headed down to the World Cycling Center, and saddled up for the long day ahead starting with a casual roll down the valley to the town of Bex. With over 18 kilometers of road between Bex and the summit, my plan was to pace myself again. It worked on Torgon, it would work again this time. Like on previous climbs, the big power riders rode off into the distance, but not at the hot pace that they’d done before. Also, I noticed several more started behind me as we climbed out of the vineyards. I knew I was going to need to feed on this climb, so I aimed for the town of Cryon to gauge my energy and fluid levels. By the time we reached Cryon, I was locked in a battle with Robert. He had awesome attacks that could keep pulling me back. I resisted the temptation to chase him down, keeping my pace. The strategy paid off, as Robert ran out of attacks and I pulled ahead, bridging a lap gap, and putting him out of sight. I now found myself completely alone on the climb making it easier to hold my rhythm. Big climbs are all about pacing, rhythm, and form. Pacing and rhythm is a symbiotic pair that boost each other. Form is the glue that binds the two together. For anyone that’s done the Elements of Style video, they would have learnt the power of checklists that helps you regroup yourself, a mental checklist to run through on the bike, that both distracts you from the suffering while boosting your efficiency. 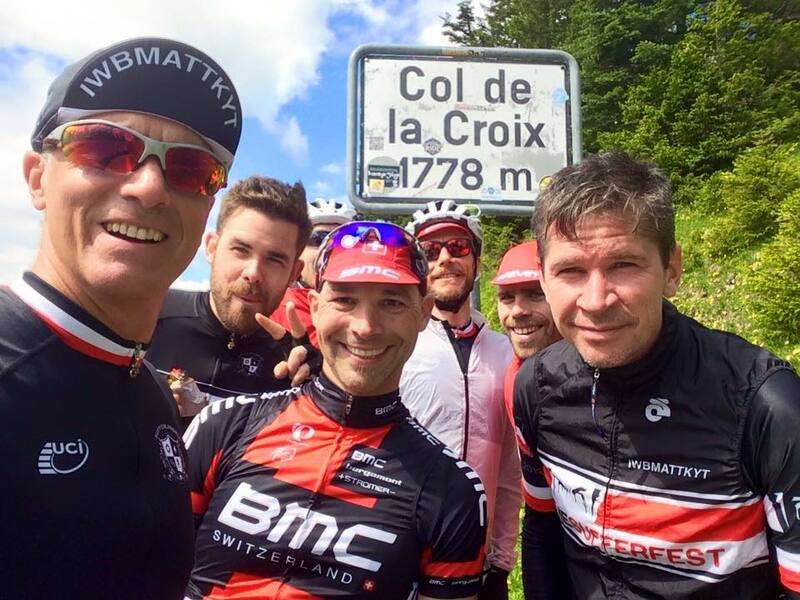 The final part of the journey was the Route Col del la Croix, a twisty carpet, weaving its way through the Alpine farmland, surrounded by the beauty of the Alps. 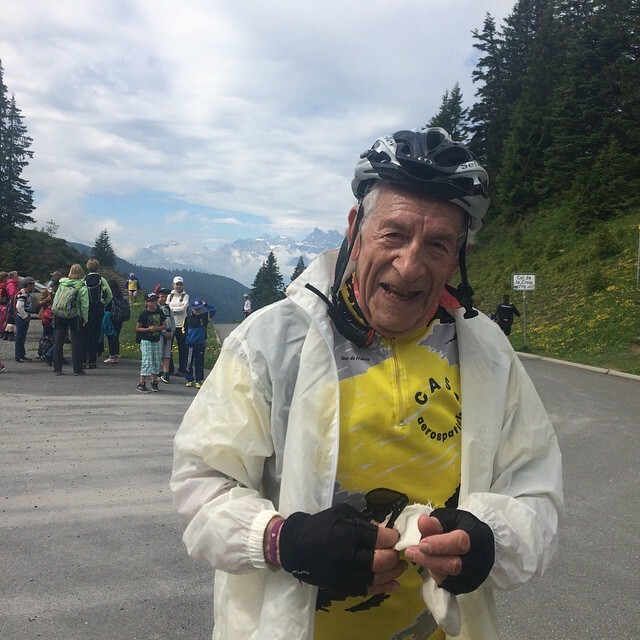 It was the last place on Earth I’d expect to be chasing down an 81 year old, grinding the gears on such a massive climb. It was amazing. I hope that I can still be climbing the Alps at 81. By this time, we are now regularly passing ski lifts, a sign that we are high in the mountains. The road is scattered with the big names of Froome, Cav and Nibali. A stark reminder that Froome attacked Nibali on this very climb during the Tour de Romandie. I can only imagine the pace the pros fly up climbs like these. Waiting at the top is half a dozen of the team, cheering my final pedal strokes to the top. What a feeling it is to know you’ve climbed over 1200 meters. Dam I love Switzerland. The summit was a great chance to grab some photos, and discover amongst some of the most amazing views on the planet. 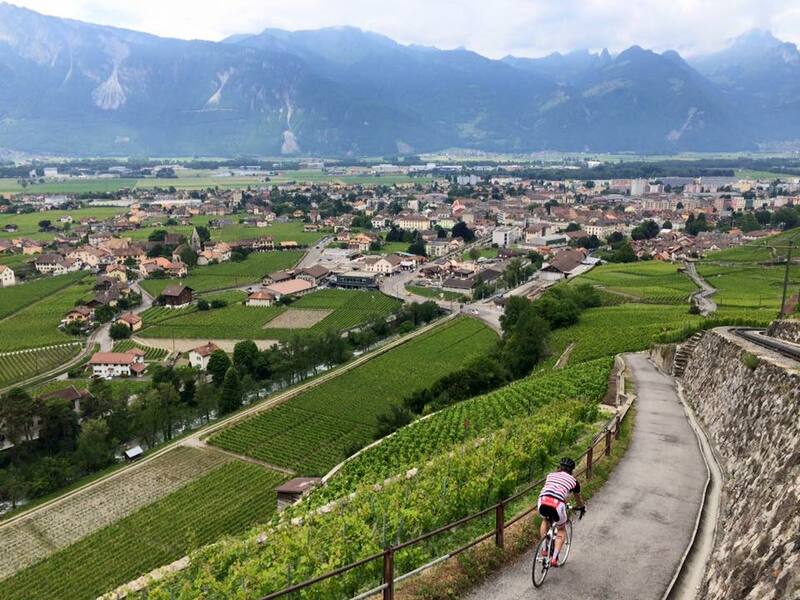 Given a choice, the group could either go hunting for another climb or descend back down into Aigle. Come on, we are Sufferlandrians. Where is the two more climbs option? So, we threw on some warmer clothing for the wind chill of the descent, something that would test my fading breaks. You see, the day before I flew to Switzerland, I was involved in a crash with a motorbike. This required a same day replacement of my wheels. I forgot to change the pads. So the 8000 meters of descents I had down that week were wearing down the carbon pads on allu wheels. Soon, our guide, Alain, had us turning off the main road onto the Le Crettex, a short 4km climb that would send us to 400 meters of elevation. It seemed my legs were loving the climb, as I could have done double that. 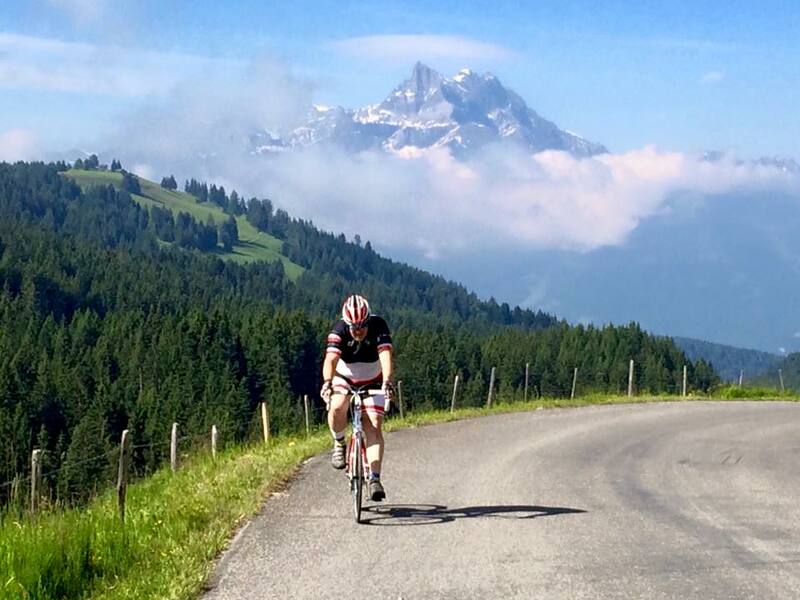 Switzerland makes climbs enjoyable, stunning, and fulfilling. Rolling down the back descent and onto the main road, everything was downhill from here. But fate had other plans for us. Speeding down Champlillon, the group was in a groove. It seemed Neal’s cornering lessons had boosted skills and confidence. I was locked in a battle with Joseph as we weaved our way down the road. I was fortunate enough to have the camera recording. I can’t wait to review the footage. But we were soon stopped by a police blockage. Further down the road, closer to Aigle, there had been a fatal car accident. Emergency services were busy attending to the incident. All motorists were being turned around. The police wanted us to go back over Col de la Croix to reach Aigle. While the challenge seemed tempting, we had plans for the afternoon. So Alain negotiated our way past the blockade on the condition we use a small back road to get around the accident. It is the road that has one of the steepest hills in Switzerland. The 27% grade descent on a rough surface tested every one’s brakes, especially my fading pads. It was like skating on ice, as we delicately made our way down the hill and into the edge of Aigle. Fortunate for me, one of our guides, Chris, worked at a bike shop, and he offered to bring new pads for me the following morning. What an epic day. 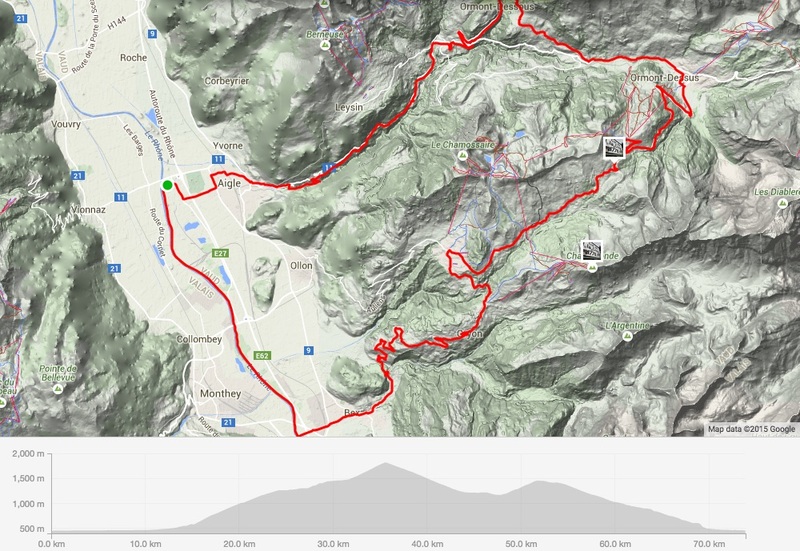 We had a total of 75km with close to 1800 meters in elevation gain. The team had pushed through one of the biggest rides of the week, and it was done before lunch. What on earth could the afternoon entail?